We sold Brynjar from Dalalif to Northern California this past fall and we are so happy he has found his person in Ayla Green. 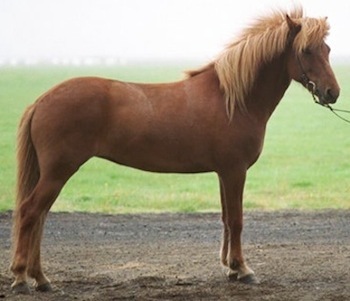 Brynjar is a son of Landsmót winner Vilmundur frá Feti and first prize mare Gola frá Höfðabrekku. 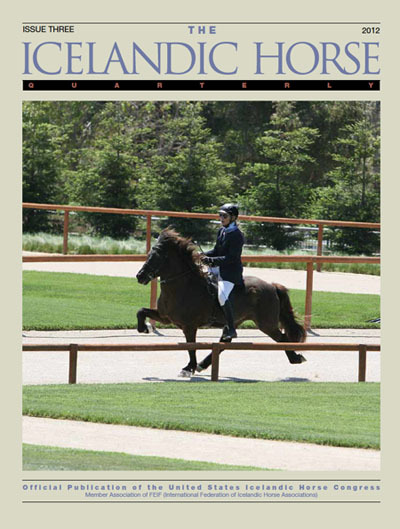 His dam came from Iceland in foal with him so he was born here in Santa Ynez in 2007. We look forward seeing them together in the future. Olil Amble came this past weekend and taught a clinic. 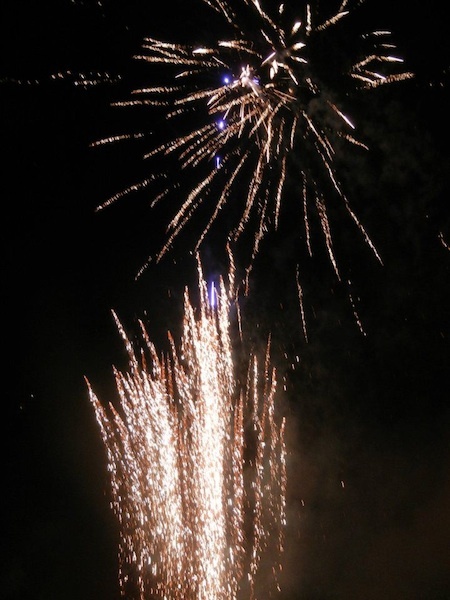 It was a great success as always and we hope she will come back next year! 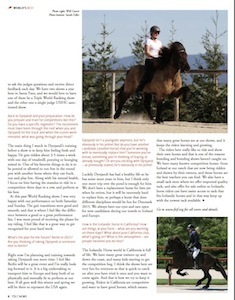 There is an interview with Ásta in the newest issue of Töltnews. We have decided to have our spring show April 27-28, 2013. Save the date and come and join us! For more info go to the CIA website. 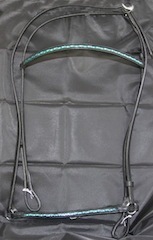 We have a Black Friday discount on Bridles, Reins and Halters in stock. 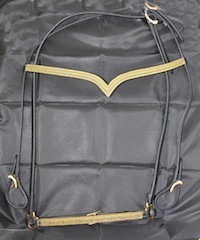 Use promo code BLKFRI2012 at check out. Also Free Domestic Shipping on all Saddles. 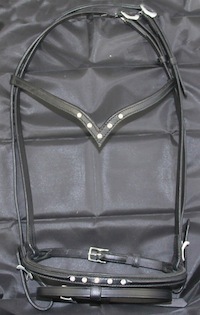 Go to our online tack store for more info. The 2012 WorldRanking list has been released. Ásta is leading T1 and Fourgait combination and she is second in V1. Ásta also has the highest total score in T1 in the year of 2012. 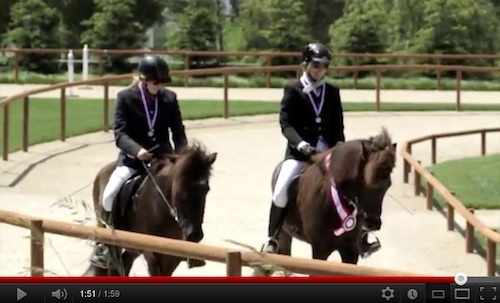 This is a great honor and especially for a non European rider to be on the top of the list. for full WorldRanking lists go to the FEIF website. 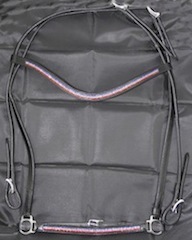 We have added new bridles, reins and halters to our tack shop. 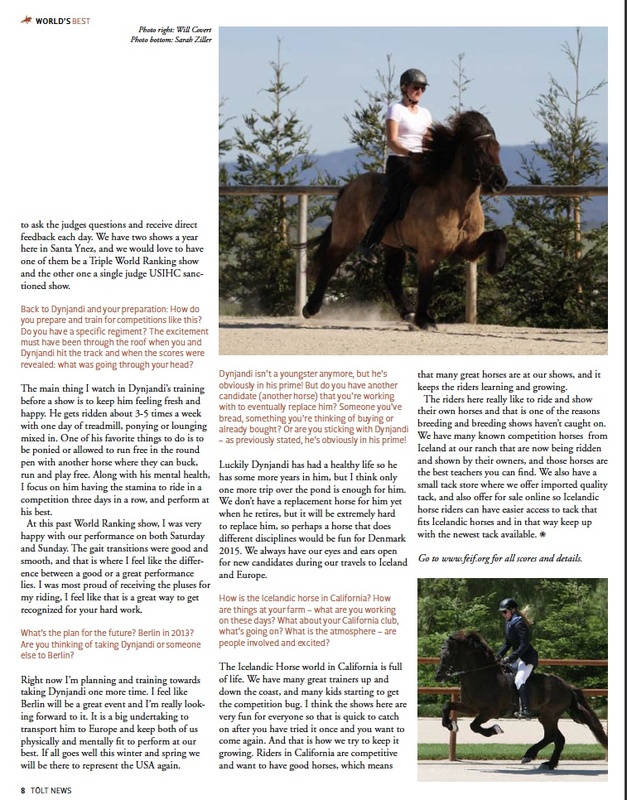 If you are looking to dress up your horse for a show, demo or just for fun check it out. Our Fall show was this past weekend. 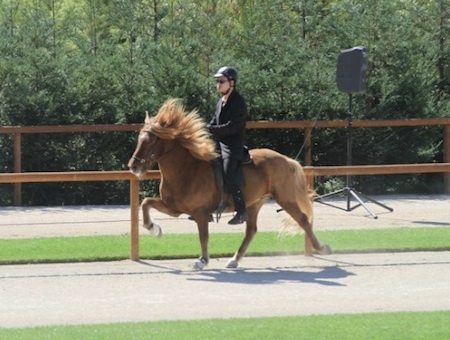 We all had a lot of fun together with our common interest the Icelandic Horse. 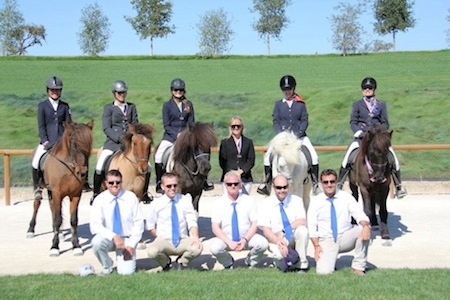 Laura Benson brought her group of riders from Northern California and they all looked great with their horses. Keith was so nice to be our DJ and Announcer for the weekend and we hope he will come in the spring again! Hannah helped with the gate and the Los Gatos husbands did catering during lunch time. Nicolai came from Denmark to be our judge and Christina was his assistant for the weekend. The Flying C riders did very well. Anne-Marie rode Húni, Bragi and Sörli. 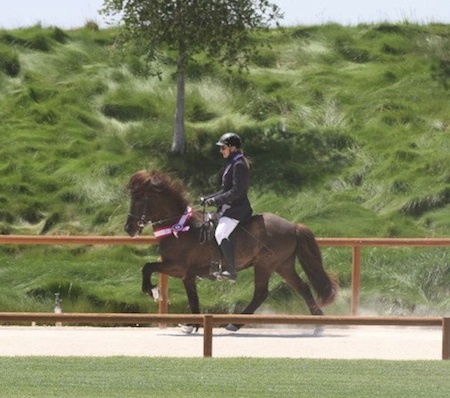 She rode Húni in T2 and they scored 7.60 including 8.0 for loose rein. Bragi scored 7.0 in T1 and Sörli was in the 100m pace race. Rachel rode Kaliber in T1 and V2. 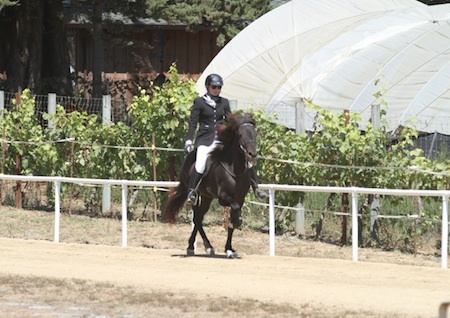 They did very well in fourgait and scored 7.5 for canter in the preliminaries. Dominic rode Byr in T3 and V2 since now he has scored out of Intermediate classes. He scored 6.7 in T3 including a 7.0 for Fast tolt. Willy rode Þór in F2 Fivegait for the first time and scored 5.7 including 5.5 for pace. He also won the 100 m pace with him. Willy also rode Drift in T6. Then Ásta rode Dynjandi in T1 and V1 and Maístjarna in F1 and T2. We hope to see you all in the spring for another fun show! 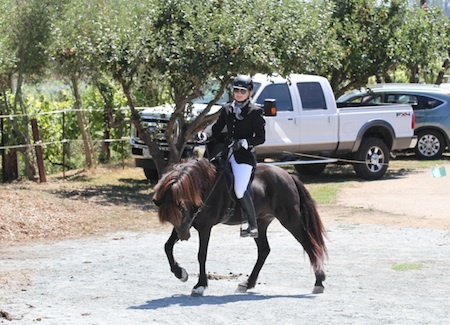 We went to the Kraftur show held at Mountain Icelandic Farm in Watsonville, CA in September. It was a very fun event and it was so nice to see all the kids that showed up. 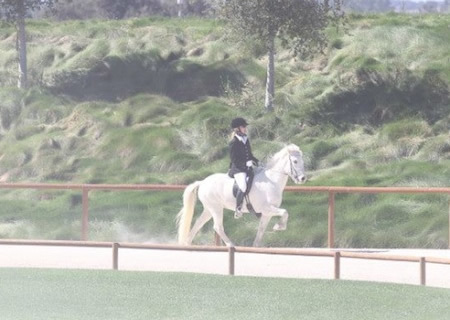 The youth classes and Beginner classes had 12 girls riding their well groomed horses. And of course it was nice to see everyone and hang out. Especially with having only one horse to take care of we had more time to mingle with everyone. Ásta rode Maístjarna in F1 and T2 and they did very well. We took our traveling Tack Shop that was a hit and by the end of the weekend many of the horses were sporting a flashy bridle from our tack shop. The brothers Vindur and Brynjar were sold this month. We were able to take Brynjar from Dalalif with us to be delivered to his new home in Santa Cruz. 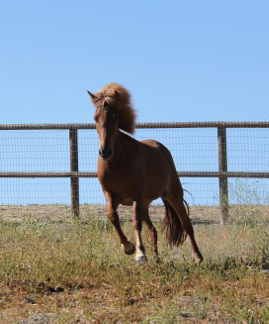 He is currently being trained by Heidi Benson of Centaur City for his new owner. 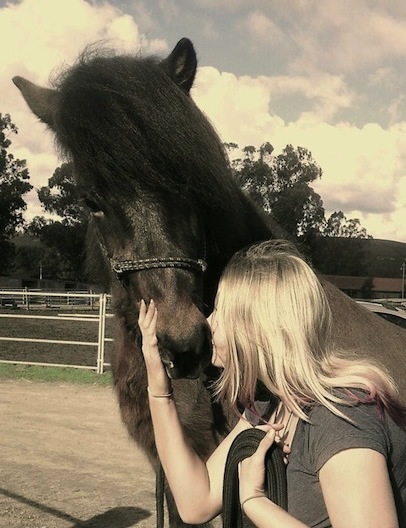 Vindur from Dalalif will be leaving later this month for his new home in New Mexico. 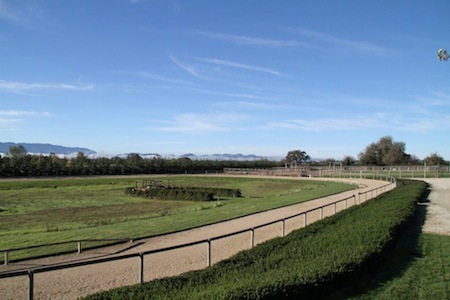 We are looking forward to the next show at our ranch here in Santa Ynez in 3 weeks and we hope to see you here! 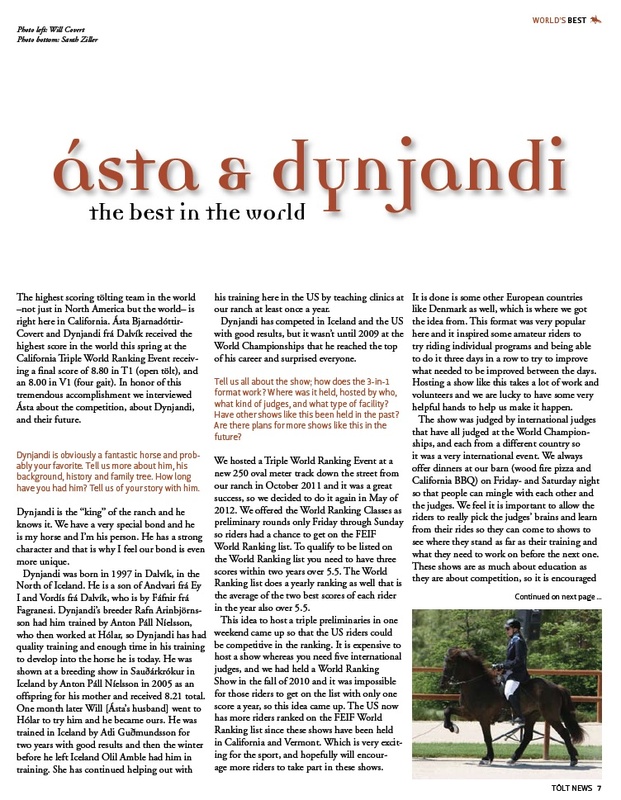 Dynjandi and Ásta on the cover of Issue Three 2012 of the Quarterly. The CIA OPEN Fall Show will be held October 13-14. For more info click here. Make sure to book your hotel in time since this is a busy tourist area. Brynja daughter of Þór frá Prestsbakka..
Brynja frá Bakkakoti daughter of Þór frá Prestsbakka became the Icelandic Champions in Youngster's Tölt this past weekend in Iceland. 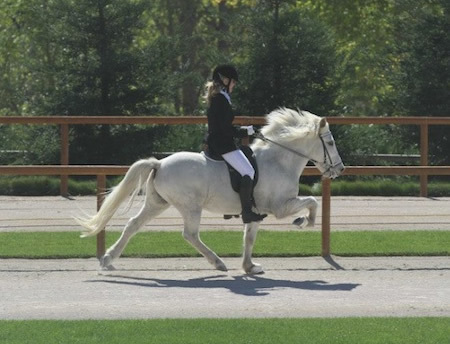 Her rider is Róbert Bergmann and they have won many titles together. 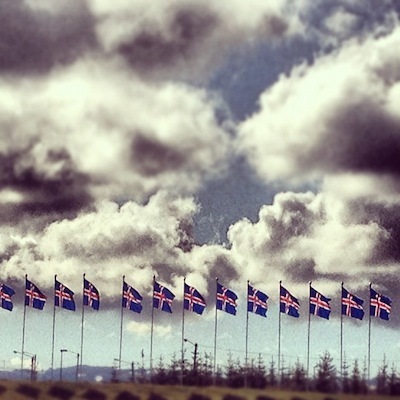 They scored 8.06 in T1 Finals and the title Icelandic Champions 2012. Þór is a avaialble for stud here at our ranch. Perla frá Akureyri sold last week. She is going to a wonderful home in Southern California. 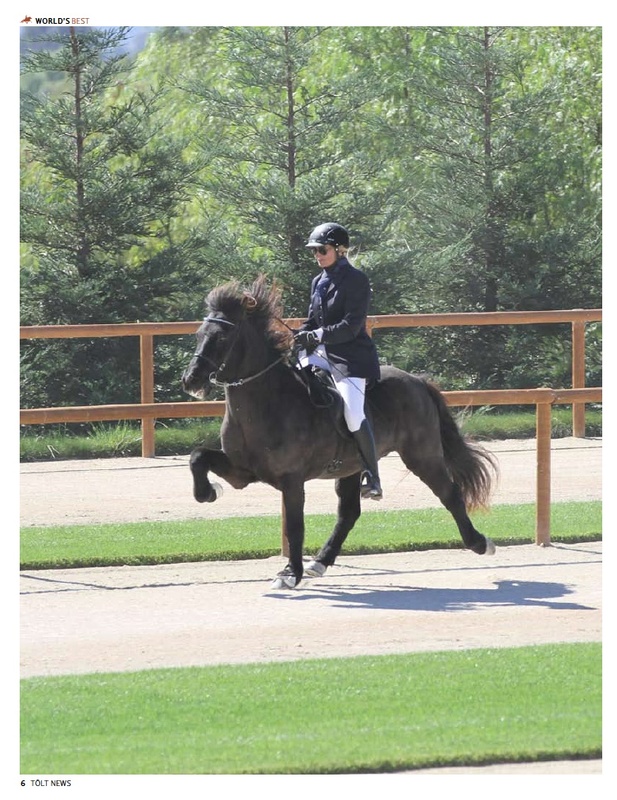 We still have few young horses avaialble for sale on our sales page. They are all well bred young horses out of first prize parents and some are ready to be started under saddle this fall. This summer has been busy and the weather has been great for riding. We went to Landsmót in the end of June where we saw a lot of great performances and had a good time with family and friends. 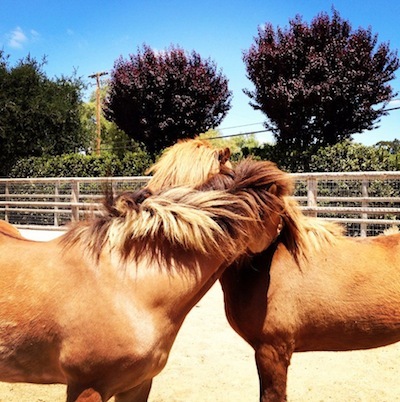 Two of the young horses we had for sale got new owners. 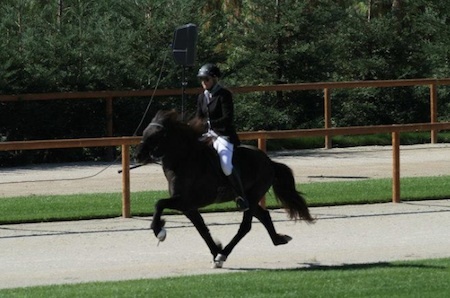 Ali from Dalalif went to his new home in Northern California in May. 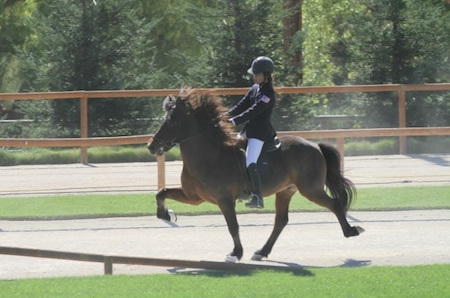 And then in June Leikur from Dalalif also went to his new home also in Northern California. We still have some young horses looking for good homes. They are all well bred out of first prize parents. 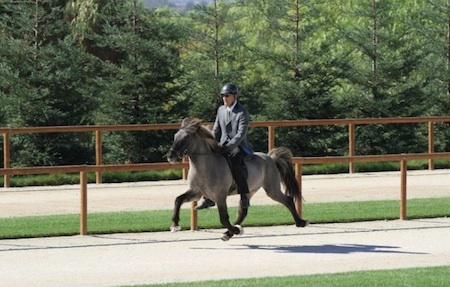 We have posted few new photos on our sales page of the young horses. 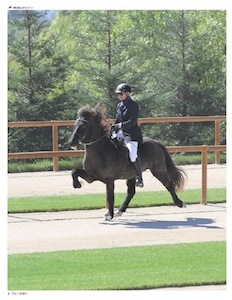 Now that we are back from Iceland and back in the saddle we are looking forward to the Watsonville show September 8-9. CIA OPEN SPRING TRIPLE WORLDRANKING.. 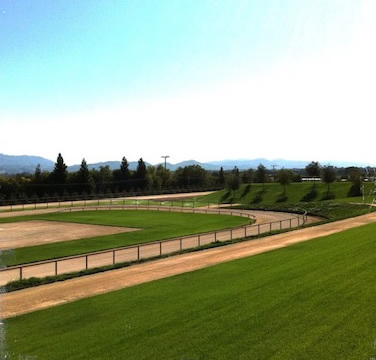 It was the second competition held at Húnavellir the new 250m track here in Santa Ynez, CA. The show was 3 days and preliminary rounds were held each day for the WorldRanking classes and finals on Sunday for the sanctioned classes so we had a little bit of everything. We had five judges that are all FEIF International Judges. They all came from a different countries too. Florian Schneider came from Germany, Nicolai Thye came from Denmark, Þorgeir Guðlaugsson came from Holland, Rune Svendsen came from Norway and Will from the US. Doug helped out with Icetest and some of the organizing of the show along with announcing and riding. Keith came and was our DJ and announcer in training and Jasmine, Ólafur and Sarah helped us out with scribing. Lindsey and Sara were on gate duty. 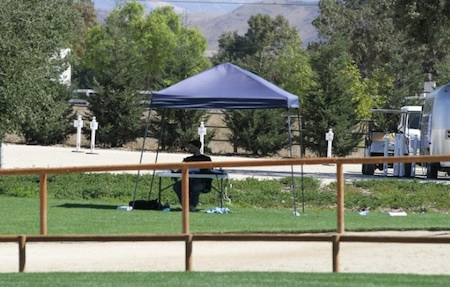 Special thanks to the Northern California folks who brought most of the horses at the show. 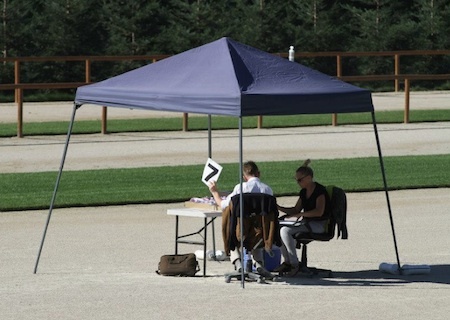 Many good performances were seen on the track as well as the outside the track. 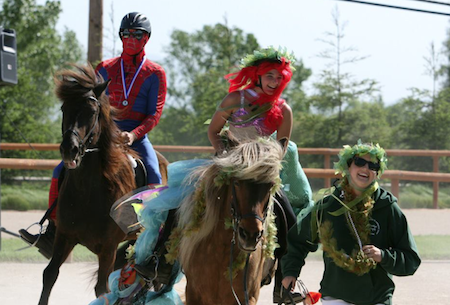 The Costume Class was a big hit and we had Mermaid Ariel, Spiderman and a little rocker tolting around the track on Icelandic horses. It was great to have more kids riding again since our kids are growing up so fast and most of them are teenagers already. The Flying C team did very well. 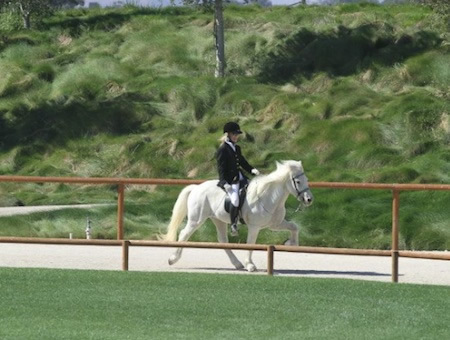 Dominic rode Intermediate Tolt and Fourgait on Friday and scored out of the Intermediate division so on Saturday and Sunday he competed for the first time in Open group Tolt and fourgait with good results. 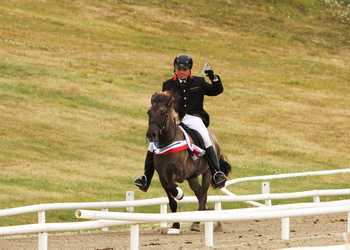 Willy and Þór won Intermediate Fourgait and Willy rode Drift in Intermediate Loose Rein Tolt and kept improving every day of the show. 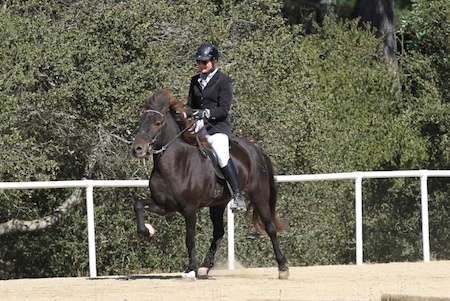 Our mare Maístjarna did good in Fivegait and Loose Rein Tolt. Dynjandi always performs and this show was no exception. He scored 8.0 in fourgait on Sunday and 8.8 in Tolt and went up a spot on the WorldRanking list in Tolt, Fourgait and Fourgait combination. It was a great success and we look forward seeing you all again in the fall! The show is coming up in few weeks. We are excited to see everyone here for another great event. We hope to see you in Santa Ynez in May for a great event! Brynja frá Bakkakoti daughter of Þór frá Prestsbakka won the B-finals at the Icetölt in Iceland Saturday and ended 2nd in the A-finals. 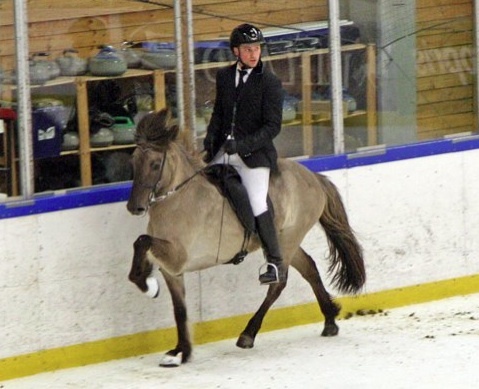 She was ridden by John Kristinn Sigurjónsson. 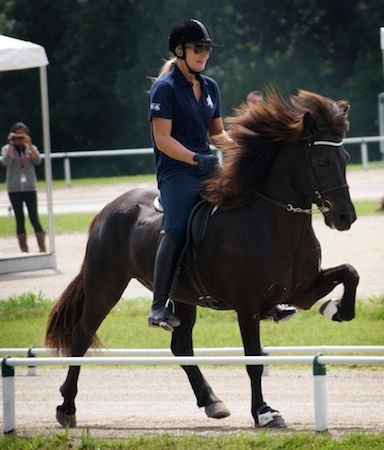 Brynja has been successful in competiton for the past few years with a young rider Róbert Bergmann. Click here to see a video of her winning the B-finals and ending 2nd in the A-finals. USIHC Member Meeting at the Spring Show..
All members are encouraged to attend if possible. A second meeting will take place later in the year at an East Coast event. The details are still under consideration. For any member considering attending the meeting in California.... 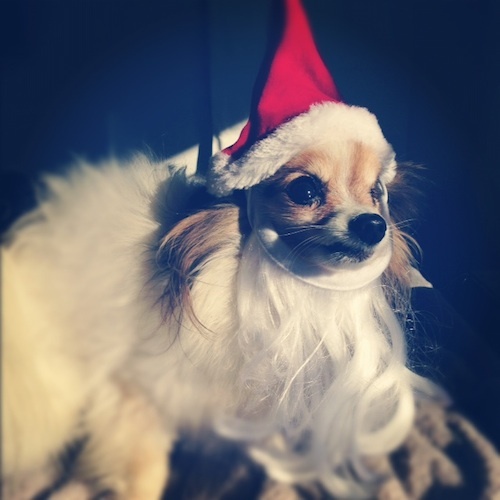 Please note hotel rooms in the Santa Ynez area are difficult to book at this time of year. Most hotels do not list with online travel sites. It is strongly suggested that you book early and contact the hotel directly to arrange your room. This page will help you locate hotels close to Flying C Ranch. The meeting will take place between the end of the competition day and the traditional pizza dinner. For those who haven't had the pleasure, this is no ordinary take-out pizza dinner. The pizzas are cooked onsite in a trailer-mounted, wood-burning oven. The result is nothing short of spectacular. If you plan to attend the meeting and join us for pizza, please contact Ásta at asta@tolt.net by May 1st to reserve your place. The cost for the pizza is $20 and can be paid when you arrive. Perla frá Rauðuskriðu foaled Saturday March 10th, 2012. 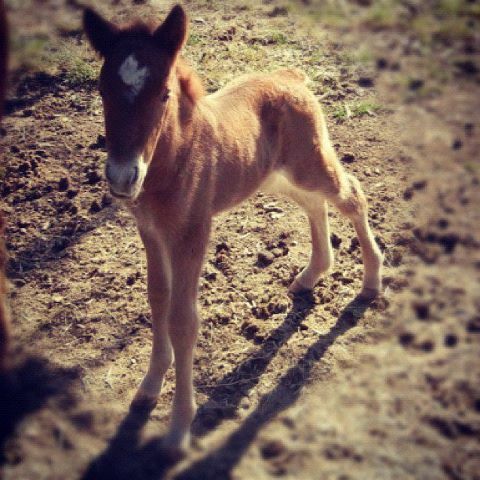 She had a Chestnut filly with a big star and we named her Sunna from Flying C Ranch. Her sire is our stallion Hrafn frá Garðabæ. 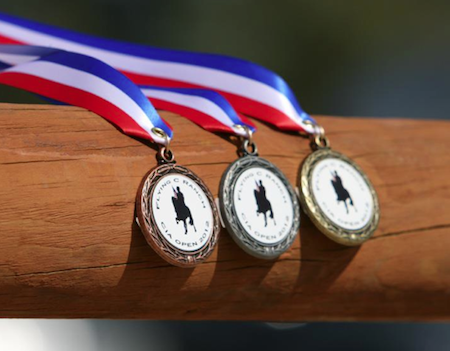 The National Ranking has been announced and awards have been sent out. We are really happy with our people bringing home 2 each. Asta won T1 and V1, Anne-Marie won T2 and F2, Rachel won both the youth classes T8 and V6, Dominic won both Intermediate classes T5 and V3. Lucy won T3 and V2 and Morgan and Laurie also won one each. Very good results! 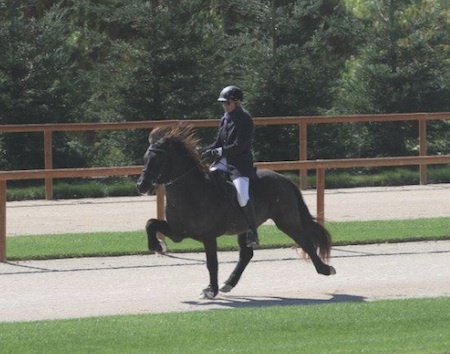 We have added a first prize mare Rák frá Akureyri to our sales horse page.